In the summer of 2013, it looked as though the 24-year-old was destined for a huge future. He had finished the previous season strongly and had extra creative burden thrown upon him by the exit of Mario Gotze. His season began with a brilliant all-round performance as BVB claimed the Supercup in Pep Guardiola's first game in charge of Bayern Munich. The outlook for club and player looked bright; then, in an international friendly, injury struck. Though the back problem picked up against Paraguay was only meant to keep him out for a few weeks, comeback after comeback was delayed and he ended up missing the entire season. This lengthy layoff clearly affected his career plans. Ilkay's contract – which he had signed upon joining the club – was due to expire in 2015. Though Dortmund were always keen to retain him, the player had constantly stalled on a new deal, hinting that he had intended to have one last season at Signal Iduna Park before moving on to pastures new. His dynamic displays in Dortmund's run to the 2013 Champions League final had earned him admirers from across Europe. Real Madrid were one club said to be interested, Manchester United another, but his injury problems put all of his plans on hold and he signed a one-year extension a year ago. Now, once again, he finds himself at a crossroads. His extended contract expires in a year's time and he could well be a huge part of the summer of change at Dortmund. Manchester United are back in for him – with reports last week claiming that a deal could already be done – but a move away should be the last thing on his mind. His eventual return was far from easy. Dortmund were already struggling badly by October and Gundogan did not have the luxury of coming back into a team as dominant as the one he had last played in. Beyond that, missing 14 months of football did him no favours. Though he has occasionally shown flashes of his old brilliance, he has found it harder to rediscover the rhythm that made him so good prior to the injury. Dortmund may not offer the same trophy-winning prospects they did when he arrived at the club but it remains the best place for him to be as he looks to get his career back on track. When he initially arrived from Nurnberg four years ago as a raw attacking midfielder, his adaptation at Signal Iduna Park was far from easy as he was forced to learn a new position. Though a better all-round player now, with plenty of club and international experience under his belt, Gundogan is, by his own admission, a naturally retiring person who takes his time to get used to new situations. "Dortmund had just won the league and that was slightly intimidating," he said, reflecting on his move to replace Nuri Sahin in 2011. "I tend to be a bit shy at first. I'm more the introverted type and I need some time to feel at ease." Though he first made his name at Nurnberg, his roots are in Gelsenkirchen, just a stone's throw away from Dortmund, and the initial struggles he had at BVB will only be intensified abroad, where he would have to work hard on improving his English even to communicate with his team-mates in Manchester. He can also look to Sahin's story for inspiration. After Jurgen Klopp's first title-winning campaign, the Turkey international won himself a dream move to Real Madrid. He appeared only a handful of times as he looked to recover from injury before returning to BVB, tail between his legs, 18 months later via a forgettable loan spell at Liverpool. Signing players with bad injury records for big money should be an issue close to the heart of Manchester United. The acquisition of Radamel Falcao on loan last summer left many fans salivating, but the Colombian has barely made an impact and looks set to prove to be an expensive mistake. 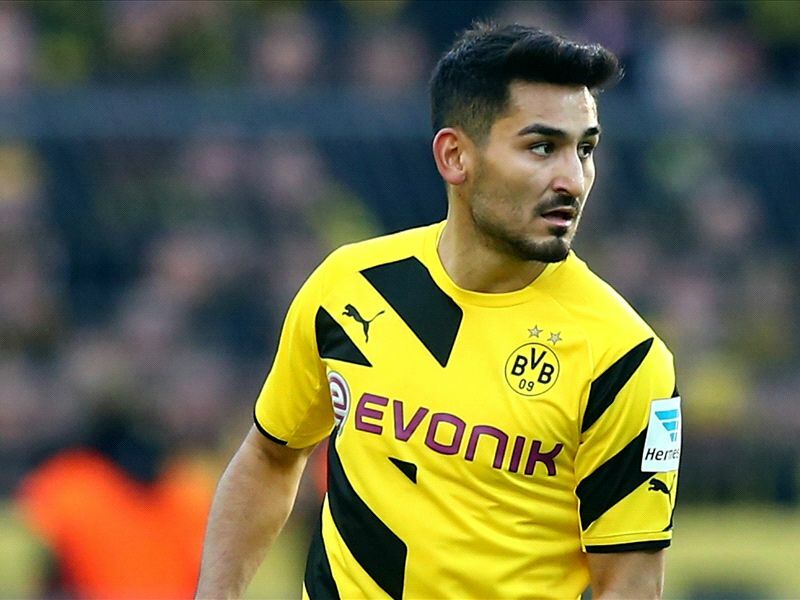 Gundogan has suffered enough heartbreak in his career but the time for him to make a choice is looming. Sporting director Michael Zorc is keen to resolve the issue soon. "His situation isn't straightforward because his contract expires in 2016," he said on Monday. "There will be a decision soon." The prospect of a season in the Europa League, at best, without any realistic hopes of challenging Bayern Munich, may not be the most appealing to Gundogan, who will soon be entering his prime, but it may prove better for his career in the long term. Then, when he is back to full fitness and confidence, he can move on and confirm his reputation as one of the world's best midfielders.